Happy birthday to meee, happy birthday to me! Today marks my 29th year on Earth and I figured, why not celebrate with a batch of boozy strawberry rose lemonade popsicles and Popsicle Week! Ever since I’ve been blogging, I can remember Billy hosting Popsicle Week and it has pretty much exploded from the first year he started. In the past, I’ve done cookie popsicles, wine popsicles, and boozy mango pops. I knew that this year I wanted to celebrate with another kind of boozy popsicle and went with what everyone identifies as ‘summer water’, rose wine. I know rose might be a littttle basic, but it’s so fun! Pink wine and lemonade with chunks of pretty strawberries? I think that deserves a birthday toast! One of the biggest lessons I’ve learned in making boozy popsicles is to not overdo it. Too much alcohol and they won’t freeze properly, too little and they just aren’t that fun! I went pretty heavy on the rose in these pops, but keep in mind that these will melt pretty quickly, so they are an eat right away kind of situation. 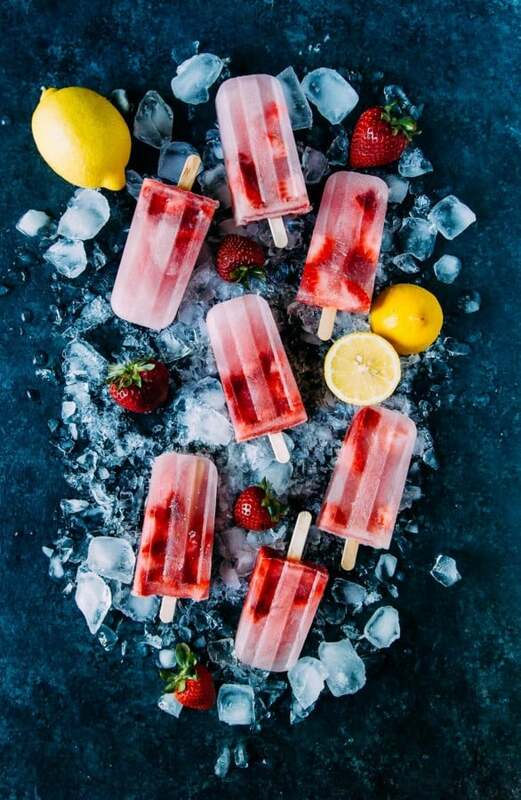 If the strawberry season has passed in your part of the world, raspberries would be perfect in these rose lemonade popsicles too, just make sure they are cut up a bit to fit into the popsicle molds. Speaking of molds, this one is my favorite and has served me well over the past few years! I’m going to keep this one short and sweet today. My husband and I are a day (and two years) apart on birthdays, so we are taking the rest of the week off to hang around Milwaukee and have a few different celebrations. I’ll be back on Friday with our birthday cake (!) recipe and maybe a bit more on how we are celebrating. Today will be pretty low key for me, with work and attending my favorite yoga class, so keeping things tame over here for now. 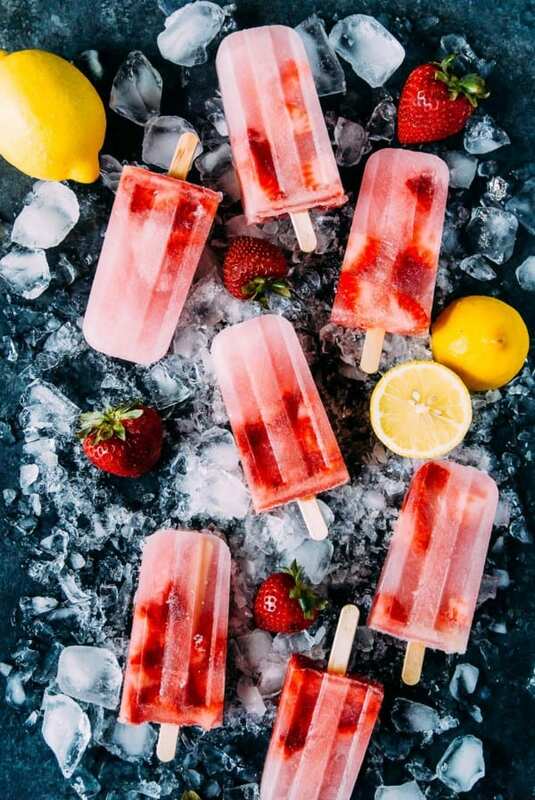 In the meantime, whip yourself up a batch of rose lemonade popsicles and Happy Wednesday! p.s. Want more popsicles? Check out Billy’s page for every kind of #popsicleweek recipe imaginable! 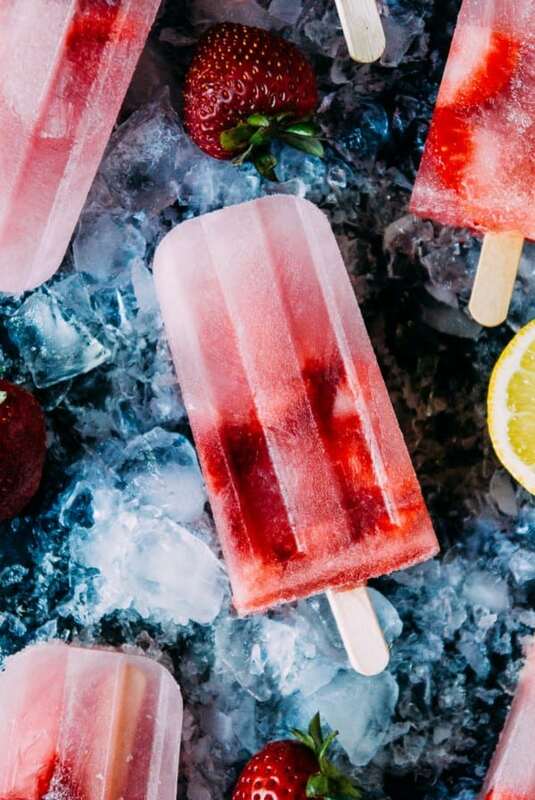 A perfect summertime treat, rose lemonade popsicles are sweet, tart, and just a little bit boozy! In a medium bowl, whisk together the wine, lemon juice, and sugar. Whisk until sugar has been dissolved. 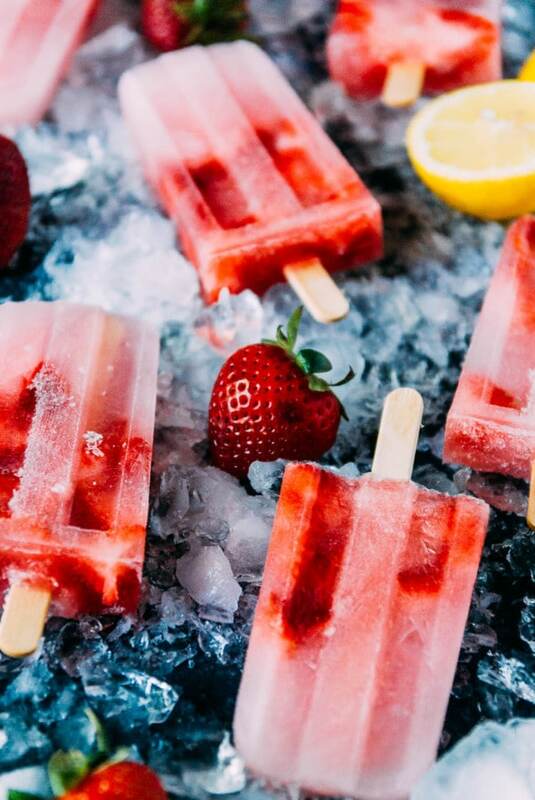 Pour evenly into popsicle molds and drop in the chopped strawberries. Freeze until solid, at least 6 hours or overnight. You had me at rosé! These look so beautiful and refreshing. Happy Birthday! I made these at Thanksgiving in freezer pop bags and they were a huge hit! Making them again now for Christmas. Delicious and easy recipe!! !